A campaign group has urged consumers to avoid buying strawberries grown in Spain in winter because, it says, they damage the environment. WWF says that crop cultivation is causing an "environmental catastrophe" in the country's southern wetlands. The group claims that the irrigation required for the berries is draining water from the region's wetlands. Some 95% of Spanish strawberries are grown around the Coto Donana national park in southern Spain. The 5,000-hectare (12,300-acre) site, surrounded by strawberry farms, is a UN World Heritage site. But WWF says that water irrigating the farms is reducing water to the Donana marshes by up to 50%. "By buying Spanish strawberries - on sale in supermarkets from January to April - you are supporting the destruction of the Iberian natural milieu because the impact of this cultivation on the environment is catastrophic," the group's Paris office told AFP news agency. The group says that strawberry cultivation is highly polluting, resulting in 4,500 metric tons of plastic waste each year and pesticide pollution. 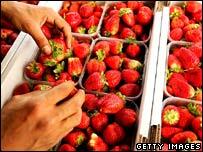 Germany and France are the largest importers of the 330,000 tons of strawberries grown each year. A spokesman for the Spanish arm of the French supermarket giant Carrefour said they purchased their strawberries from a sole supplier whose production methods were strictly monitored in line with European standards.